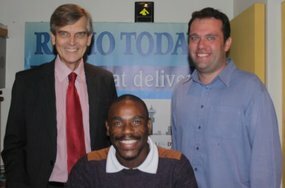 @PBracher1 @NLegal_ZA with David Cote from Lawyers for #HumanRights (#LHR; @LHR_SA ) @EricaEmdon. Patrick Bracher, Director at Norton Rose Fulbright South Africa Inc hosted, David Cote from Lawyers for Human Rights (#LHR). David has been been with LHR since 2006. He is currently the coordinator of LHR’s Strategic Litigation Programme and previously he worked in their detention monitoring programme. Topic: #LHR will be holding an event in Pretoria for Human Rights Day regarding the criminalisation of the poor and so-called “clean sweep” operations that have been happening in different cities around South Africa. Although this phenomenon is not new, it has recently come to the fore again with Operation Ke Molao in Johannesburg and the re-introduction of the “#dompas” for gardeners in Worcester. David can also speak about the bylaws which are in place in various municipalities which prohibit loitering, but the unlawful use that has been made of those bylaws in the past to remove “undesirables” from the streets.